A little while ago, award-winning columnist John D. Sutter from CNN wrote an email to Cycling Embassy of Denmark, expressing his desire to get more an insight of how Denmark is going about the country’s ambitious plans to fight climate change. In our recent newsletter we wrote about the fantastic project called “Cycling Without Age“. We invite you to view the magnificent speech founder Ole Kassow gave at the TedX CopenhagenSalon event on mobility at Copenhagen Airport on september 17th. Danish bicycle culture in a nutshell. 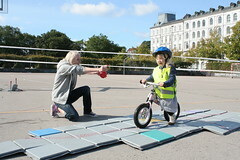 View this nice little video about the Danish cycling culture by ConsiderDenmark. The City of Copenhagen will be hosting the UCI Road World Championships September 19 – 25, 2011 and the city plans to celebrate this with a Bicycle Festival that offers exciting and fun activities and events for people of all ages.